I had a great time playing Blades in the Dark (BitD) last night! Here in no particular order are a few of my early thoughts about how I might make it better, and challenges that we might need to face as we continue the campaign. BitD is a storytelling game, so there are few solid combat mechanics. 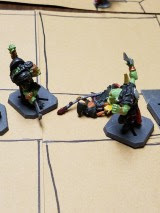 Instead, players say what they want to achieve, the GM with the help of the players all decide what the stakes of failure are, and there is a roll. That ends combats really fast, and can make completely combat-oriented characters kinda dull. Consequentially, there is no need for figures or barely even a map. Players may decide where they want to "enter the scene", so there were quite a few "scores" (thief jobs such as burglary) where one or more of the characters never even made it "on stage". Another reason why characters seldom made it "on stage" was because of the "flashback" mechanic. Every "score" starts play with the job already in motion. 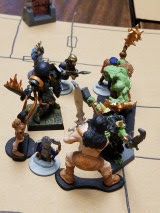 There is a discussion of a general plan, but then there is a roll to see whether things are going smoothly or whether the excrement has really hit the fan and roleplaying starts immediately. Instead of careful planning before play, there is a "flashback" mechanic where a player may tell a story about what their character did in the past to be ready for the score. For example, when Tim's Lurk character ran into a locked door, Jason's Leech character went back in flashback to burn through most of the lock with acid. Tim's guy then just bumped it free and entered. I'll make a "scores" deck so that we can easily "dig up" jobs for the crew to do between building their territory. That way, they can be traded and shared as well. I must admit that I love the structure of it all. Once we had characters made, we did a score and then had some downtime. Then it was just wash, rinse, and repeat. It also lends itself to our play style because players may play new characters (players are encouraged to even swap characters between them) at any time, but only play one character per "score". I probably was a little too generous with intel, but the world of Duskval is way crazy. When playing in a world with a blotted-out sun, wandering ghosts, ink-black water and whale-sized demonic monsters roaming the seas it can get a little "out there". Until we all get a feel for Duskval and where it is I'll probably not make any assumptions. Want to know more about BitD? Find the Google Plus Community here, and some videos of the creator playing the game here. 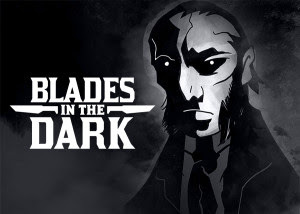 Any interest in taking a break from D&D to run a session of Blades in the Dark next session?